Recently, I’ve taking a liking to Hops a Burger Bar so much that I’ve decided to test some of my own recipes at home. Burgers are great to experiment with and easy to lure friends over for a simple supper. 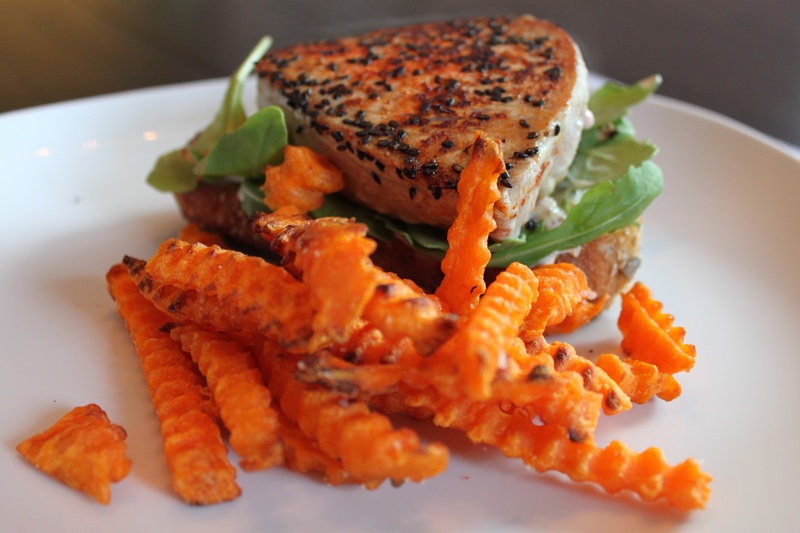 This take on a burger is an open faced seared tuna steak on top of toasted bread and slathered with a rich remoulade sauce. I love the bite of onion, caper and anchovy on a rare cooked piece of tuna. I recommend a simple season on the tuna – salt, pepper and a sprinkle of sesame seeds. Grill or sear for just a moment of two and top with this oh-so-rich sauce. Wow, that looks really good. I think I would eat it. Not so sure about the toddler he is so picky lately but that looks really good. These all sound so good! I try to eat healthy, but every once and while beans don’t seem to cut it, and I have a serious craving for meat! To help give me the protein I need without the extra fat I don’t want, I began selling a kitchen tool called “get along the crazy burger” that can take up to 50% of fat out of cooked hamburgers quickly, and without affecting their taste. If you want to know more, check out: http://www.burgerhype.com Thanks for a great list of recipes!